A simple chemical reaction causes tarnish to disappear naturally. Place sterling or plated silver in an aluminum pan — it must be aluminum. Sprinkle 1/2 to 1 cup baking soda over the silverware. Keeping the pan in the sink to minimize splashing, pour enough boiling water to cover the utensils. 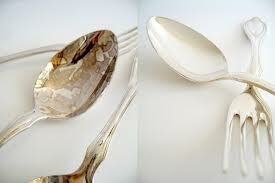 When the tarnish disappears, remove the silverware, and buff with a soft cotton cloth. This entry was posted in Uncategorized and tagged brass, silver, tarnish, tips by Miss P. Bookmark the permalink.